Photoxels: I find that using the Wi-Fi technology in the Nikon P3 to be liberating! No hunting for where I stored the cable and no fumbling around to plug it in the right way. It’s pretty simple and it works great! Every digital camera should be equipped with it. With good to very good image quality and its many practical features, the Nikon Coolpix P3 will appeal to the advanced amateur photographer desiring a compact and light digital camera with image stabilization and wireless ability. Digital Camera Review concludes that Nikon Coolpix P3 is a high-quality 8 megapixel camera targeted at the photographer who wants a bit more control over their shots. Its sister, the Coolpix P4, is identical except that it doesn’t have WiFi capability. My favorite features are the 2.5 inch LCD and the Vibration Reduction. The LCD sports a whopping 150K pixels to provide an accurate representation of the shot. The Vibration Reduction allows for more shots without blur in the available light (without having to resort to using the flash). The Nikon Coolpix P3 (and P4) is a good choice for people looking to upgrade from their first digital camera and get a camera with more features. It would also make a great choice as a second camera to a more experienced photographer who doesn’t want to carry their digital SLR with them. 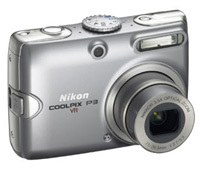 NewsFactor Magazine (link dead) concludes with rating of 4 out of 5 that accomplished shutterbugs who need a high level of control should find the Nikon Coolpix P3, with its impressive range and sharp image resolutions, to be a great choice.